10 ways Brand Managers underestimate all it takes to attract consumers. There are at least 10 ways Brand Managers underestimate all it takes to attract consumers. Over the last 20 years of developing packaging designs and brands that sell on-shelf and online, it has taught us that there are at least 10 ways Brand Managers underestimate what it takes to attract consumers at the shelf. As a Brand Manager, you must know how challenging it can be to get your product to stand out on the shelf among so many competitors. We hope this article will help you tackle some of challenges you are currently facing with your package design. This core philosophy has helped us create amazing product packs and brands. That’s why we will be repeating the philosophy several times in this article to ensure you embrace it as well! Social media has become the platform to talk about your brand and product story; and E-commerce has rapidly becoming the vehicle for “how to sell it”. E-commerce is fast becoming a primary sales tool with brand marketers confirming that. Because of this rise, they have plans to clean up their packaging designs and make them more E-commerce friendly. So, what are your customers buying into? Should you be cleaning up your packs for E- commerce? Here are 10 ways Brand Managers underestimate what it takes to attract consumers at the shelf and online. 1. What Message are We Sending? You might be surprised how a simple grammar mistake can make a huge difference to the meaning and outcome of your design (especially to grandpa!). When it comes to sending the right message, we need to be very clear on our messaging hierarchy. All too often, we send confusing and mixed messages because we are calling out too many benefits. A confusing message leads to lost sales. What is the single most important message you need your pack to convey? Is your product packaging saying that? Your product pack and product messaging (above and below the line) must speak to where your target customer is located on the purchase decision loop — the Nescience Loop©. 2. Do You Know What I Know? How consumers buy will depend on the type of purchase decision they are facing. When making minor or routine purchase decisions, or re-purchase decisions, consumers will typically apply less thought to their decision making. In fact, many consumers will even skip through the buying decision steps and just stick with a brand or product they know and trust. On the other hand, when it comes to more involved purchase decisions, consumers will invest much more time and effort to decide. By knowing what your target consumer knows, you will be able to position and tailor your product pack and message to attract them. In fact, at Jam&Co, we developed a tool to help our clients discover what their target consumer knows — by using the Nescience Loop©. Knowing where the consumer is sitting within this loop can save Brand Marketers thousands of wasted dollars where they may be targeting the wrong message to the wrong audience. We can then use this knowledge to create the most compelling messages to appeal directly to our target consumer. Let me ask you this question — What does it take to create a design that gets found? When a consumer has an “itch that needs to be scratched”, will they find you amongst the plethora of similar products in the supermarket or online? This is where your product packs have to do the heavy lifting and sell themselves into the shopping cart. A distinct and memorable product pack will help your target consumers to easily remember you and your brand. A powerful brand message about what they’re buying into, has become a powerful selling tool. Here’s an example: If I am looking for a healthy sugar alternative, how would I discover yours and why should I select it? With limited marketing budgets to apply to above-the-line advertising, Brand Marketers need to leverage their packs on shelf and online to ensure they convert to sales. Imagine if your product pack on-shelf is a “silent salesman/woman”, how equipped are they to make the sale for you? Effective packaging design is more than just pretty labels. A great pack must be strategically designed so they get found and bought. It must disrupt the category and stand out. It must surprise and delight the consumer looking for a new solution. What is the purpose of your product pack design? Grab the consumers attention, and get them to put your product into their shopping basket or trolley. Grab attention in a highly competitive market place. ie: on the supermarket shelf – This is what we at Jam&Co call “Surprise and Delight”. Convey information that appeals directly to the target market (the more personalised the better) and connects with what they know and what they desire – this is where we apply the Nescience loop. 5. Can Anyone Put a Product Pack Together? Thanks to internet, we have access to new information at the click of a button. You can even hire people in other countries to help you with your marketing — but… It’s one thing to hire them it’s quite another to have them deliver a pack that is strategically designed to sell and share. Imagine you are looking for someone to help you design your product pack, so you decide to find a graphics designer. You can easily find someone to help you design your product pack. You might even ask your nephew who studies graphic design at university to help you. Graphic designers are a dime-a-dozen. Almost anyone can design a package, but creating packs that sell is an art form that takes years of researching, testing, and problem solving. Designers with years of experience and specialisation can help you navigate profitable and creative trends, specifically target your message to consumers, and get your products to fly off the shelf and online. Are you just looking for a pretty design, or do you want a pretty design that sells and gets shared? If you wonder how much you should be paying for your packaging design – take our 10-min quiz and find out! According to a study by Roy Morgan, 70% of grocery shoppers have a fixed routine when they go shopping.They’re in habitual mode. We actually wrote a great post on how you can break the routine buying habits of your customers. You can read it here. It’s surprising how marketers believe they know more about the consumer, than the consumer knows about themselves. Most average marketers, they think they know what the consumer will go for and what they want. The best marketers know differently. The more they know, the more they know they need to know. Product packaging design experts know they don’t completely understand what the target consumer wants. Yes, you read that correct. Experts know that they don’t know. That’s why they do in-depth, rigorous testing and research to find out what, where, why, and how their target consumers buy. You have to dive deep into the consumer’s mind to understand what, where, and when to push your product messaging. If you are interested, have a read of our “One of the most costly mistakes a Brand Manager can make” blog post. Packaging design is a whole lot more complex to create than simply pretty pictures. Packaging design is a highly complex process which starts way before the designer ever sets their pen to paper, or their mouse to the screen. It comes down to perception. The perception between what a client believes they should be paying for and how much the design costs to produce. This perception is directly related to how well brand managers truly understand the process and everything that goes into the creation and development of an effective package design. Last month (Feb 2018) BRAND PACKAGING Magazine published its 2018 State of the Packaging Industry Report, a US poll which garnered responses from accomplished professionals with key roles in a variety of consumer packaged goods sectors. The vast majority of respondents interviewed, a whopping 84%, believe that the role of packaging in brand building has increased considerably over the last two years. That’s an increase of 15 % compared to how they responded back in 2017. This increase indicates the growing power packaging has when introducing, establishing or expanding a brand. The packaging report shows that over half of survey respondents planned to allocate more resources to marketing and design-related services in 2018. The look and feel of the packaging has a direct impact on whether your target customer notices your product or not. The choice of material or form that is selected will affect the consumers choices and the production, shipping and attrition costs. It’s also no secret that the pack’s first real audience is the supermarket buyer. The corporate buyers will determine whether or not your product even makes it to the shelf. Supermarket buyers can be even more picky than your target customer, and will often reject your product based on their packaging. There is so much that goes into creating a pack that Wow’s on shelf and online and then still wow’s when the product is taken home and shared. Shareability is becoming a major requirement for brand marketers looking to optimise their packaging design spend. Remember when Beanie Babies were hot, then suddenly they weren’t? What about Myspace… it started in 2003 and peaked to 90 million unique visitors in 2010 then it started dropping and eventually fading out from everyone’s mind by 2012 as they switched to Facebook and Twitter. Here’s the problem with trends, especially for packaging designs, how long will they last? One day, a certain trend is hot, and the next day, it’s not. Picking the right trend at the right time (at the beginning of the bell curve), will see your sales and profit soar, however picking the wrong trend or a trend that is in decline will see dives in both sales and branding. This is where the best seperate from the rest – Experienced packaging and brand designers have the street smarts, knowledge, and awareness of which trends to follow and which one to pass on. Let’s bring this back to how this will affect your product packaging and design – What design trend you choose to follow, or not follow, will make you stand out to your consumers both on shelf and online. What Will Influence Consumers Choices in 2018? In the business and corporate world, you have to keep innovating and evolving; or you will lose. This is why your pack design and product messaging is an art and science. Keep the innovation happening while keeping the risks and costs of failure down. The well worn and most often cited example is the well trodden Tropicana design failure. This revolutionary design failure bodes us all well to remember its costly lesson. Consumers didn’t like it, consumers couldn’t find it and when they did, they criticized the new design on social media. 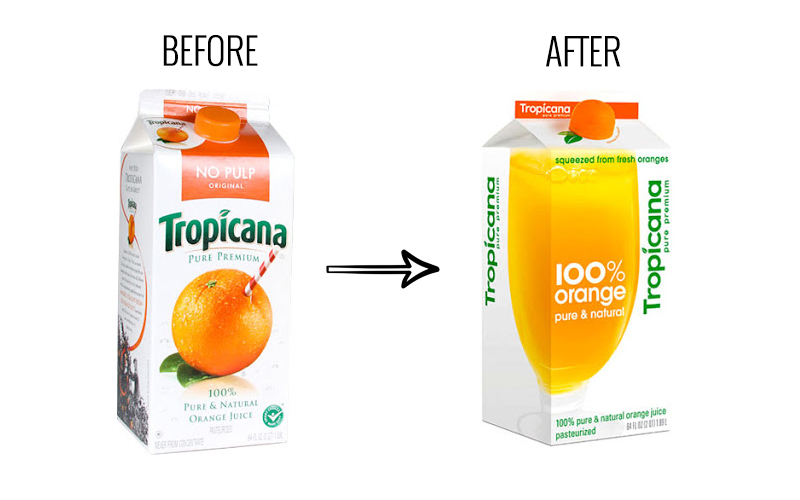 Within 2 months of the launching the new design, Tropicana saw a 20% drop in sales – $30 million. They was forced to go back to its original design that consumers were happy with. This was a huge lesson for everyone – Tropicana, brand marketers, package designers, business owners, etc. You can use this lesson as a reminder of the high risks and costs which can prove devastating if you get it wrong.